A TiVo Guru Guide is basically a third party, in conjunction with TiVo, recommending a set of programming based on a theme. The organizations that currently participate in the Guru Guide program range from Animal Planet (largely kids' programming) to Maxim Magazine, and also include CNET, Sports Illustrated, and Billboard. 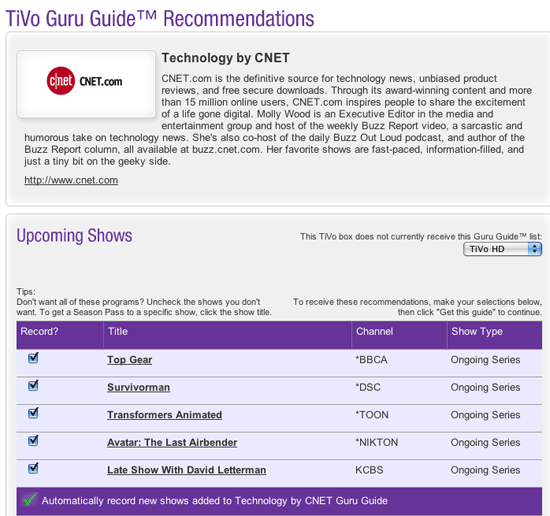 A TiVo Central Online user can either choose individual shows from the list presented online. Or the user can choose to take the entire list of shows in the Guru Guide and also capture any new shows added by the Guru.